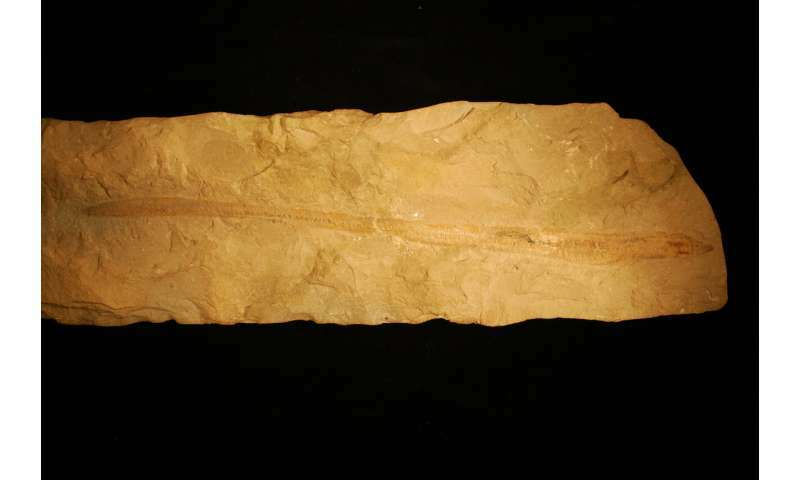 Tethymyxine tapirostrum, is a 100-million-year-old, 12-inch long fish embedded in a slab of Cretaceous period limestone from Lebanon, believed to be the first detailed fossil of a hagfish. Credit: Tetsuto Miyashita, University of Chicago. "This is a major reorganization of the family tree of all fish and their descendants. This allows us to put an evolutionary date on unique traits that set hagfish apart from all other animals," said Tetsuto Miyashita, Ph.D., a Chicago Fellow in the Department of Organismal Biology and Anatomy at UChicago who led the research. The findings are published this week in the Proceedings of the National Academy of Sciences. Synchrotron scanning of the Tethymyxine tapirostrum hagfish fossil revealed traces of chemical left behind when the soft tissues fossilized, including signs of keratin that indicate a series of slime-producing glands along the body. Credit: Tetsuto Miyashita, University of Chicago. The Tethymyxine tapirostrum hagfish fossil suggests a new hypothesis for the structure of the vertebrate family tree, with hagfish and other eel-like creatures branching off early from the lineage that gave rise to modern-day jawed vertebrates, including bony fish and humans. Credit: Tetsuto Miyashita, University of Chicago. "In a sense, this resets the agenda of how we understand these animals," said Michael Coates, Ph.D., professor of organismal biology and anatomy at UChicago and a co-author of the new study. "Now we have this important corroboration that they are a group apart. 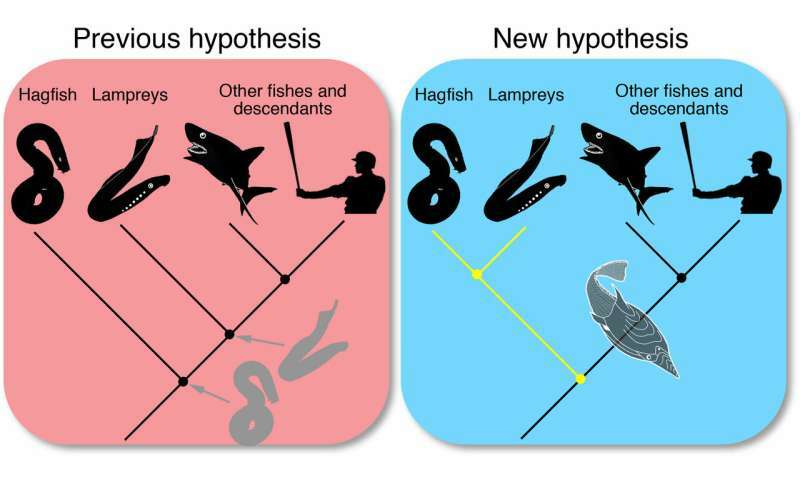 Although they're still part of vertebrate biodiversity, we now have to look at hagfish and lampreys more carefully, and recognize their apparent primitiveness as a specialized condition. Given that the speed of light has been exponentially slowing down these numbers like 100 million 15 billion are wrong. It makes no sense that we are still carbon dating based on flawed science like saying the speed of light is constant and has always been. Can someone be a creationist and not be an idiot? I don't think so. Anonym makes that clear. What absolute rot. Read your bible too closely and your brain dies an agonizing slow death. There should be a warning label: "This book has been shown to be a potent brain poison. Study at your own risk."